Now it happens that I screwed up. Unusual as this is for me, it did happen this one time. I rousted my wife from her slumber early Monday morning and set off to the Naples area for a bicycle tour of a wilderness area. And while we were sitting in a traffic jam on the freeway in jeopardy of missing what I thought was a 9 a.m. appointment, my wife pointed out that the tour was scheduled for 1 p.m. “That’s what it says on the schedule you printed,” she said. “Well, now what are we going to do,” she asked. So I had to save face. My solution was to do exactly whatever she said. We saw a sign for the Corkscrew Swamp Sanctuary. It happens that my wife’s friend had taken a tour there and recommended it to us, and I had actually researched it prior to our setting off on our trip. (It’s true–I really did!) And, in fact, I had suggested we go to the sanctuary, but on a different day than our bicycle tour. As luck would have it, the sanctuary was more or less on the way to the tour appointment, so we set off to find it. Turns out it was pretty easy. We were traveling south on I-75 from Ft. Myers toward Naples. We took Exit 111 (Immmokalee Road) 15 miles east and followed the signs to Corkscrew Swamp. We arrived about 9:30 a.m., a good time, actually. There were only a few people in the sanctuary at that time. Admission is $10 each. We also bought a $2 Corkscrew Swamp Sanctuary Companion Field Guide. Char and I are inexperienced naturalists, and we were able to identify quite a few of the birds and insects we saw along the way using the guide book. If you should ever show up at the sanctuary, the field guide is well worth its nominal fee. 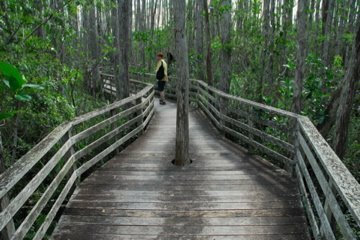 The tour consists of a two and one-fourth mile walk (with a short-cut if you prefer a shorter walk of about a mile) along a board walk that snakes through the swamp. It’s quite quiet, and people along the way tend to speak in subdued voices. The Sanctuary was established in 1954 and comprises more than 6,000 acres of swamp land. Initially isolated and almost impossible to access, this small portion of the swamp is now available to those who wish to take a walk. It is home to one of the largest remaining stands of ancient bald cypress left in North America. And a lot of wildlife, too. Many visitors to the sanctuary are bird watchers. Quite a few are taking photos. In fact, I am somewhat of an amateur photographer, and I was amazed at the cameras and lenses I saw. 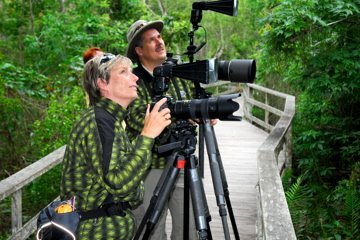 I encountered on couple, Reinhard and Jutta from Orlando (seen here), who both had cameras set up to photograph birds at a feeder. There is ample opportunity to take photos all along the boardwalk. And if you have questions, you will soon encounter one of a number of field guides who patrol the boardwalk looking to answer any questions you may have. They are quite helpful and willing to speak with you until your curiosity is satisfied. So it turns out that what appeared to be a small disaster after sitting for an hour in an I-75 traffic jam turned into a more or less very enlightening and fun–if somewhat serendipitous–experience with nature. Of course, I took credit for this. I mean, after all, if I hadn’t gotten started early . 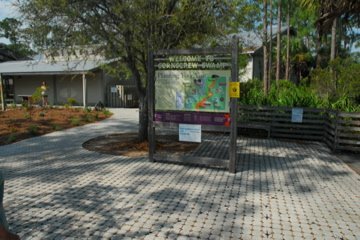 . .
Corkscrew Swamp is one place recommended to us by one of our “bird friends.” I am so glad to read this. We will check this out on our next trip to Florida. I would love to have that kind of camera equipment! Heavy Duty stuff right there.